Lana Ackerman came and worked on my horse at Edinburgh Castle using the Emotion Code Technique. Ed is an ex-race horse and whilst he has a good life and has been well treated, he still carries some ‘quirks’ from the race track. He is a relaxed horse as thoroughbreds go, but he still does a lot of wind-sucking, which was a huge problem for him. There did not seem to be any pattern as to why or when he wind sucked, which can be extremely dangerous for the horses’ long term health and I could not stop him no matter what I tried. I was completely amazed when Lana came to work on him. Not only did he let a stranger in to his stable (which is testament to Lana’s calm and reassuring energy) because Ed has serious personal space issues, especially in the stable, but he seemed very willing and even grateful to have Lana working on him. Literally within minutes he was totally relaxed and for about an hour whilst Lana was working on him he stood totally still, almost like he had had a sedative, which is a FIRST for Ed, who usually wants people out of his space pretty quickly. A lot of Ed’s ‘stuff’ appears to be a hangover from his racing days, where horses are not treated as horses, and so they develop a lot of nervous tension and ‘issues’. A lot of what Lana picked up made a lot of sense when I observe Ed’s patterns of behaviour. The difference the session with Lana made was quick, effective and unbelievable. Ed immediately stopped wind sucking. For about 6 months I did not see him wind sucking at all. He has done it since, but it is not nearly as bad or as often as before his session with Lana. I definitely felt Ed completely relax under saddle after his session with Lana and the best part is that he has stopped bucking. I honestly cannot remember the last time he bucked. On outrides he still looks at thins occasionally but I no longer feel that nervousness that I used to feel, which made me nervous because I would wait for him to explode. His movement also seems to have improved, as I feel he is generally more ‘free’ in his body. 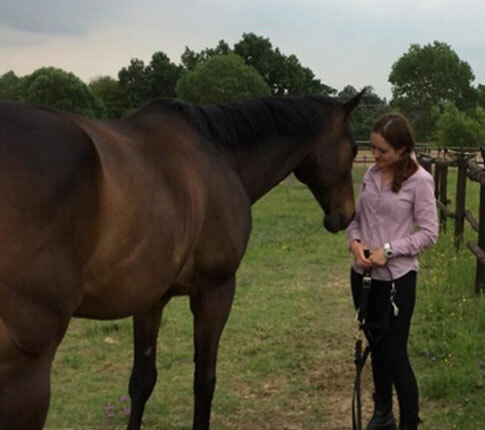 I would definitely recommend this treatment for your horse and if possible, I would have regular follow-up sessions to maintain the state of mind that the horse is in afterwards. Thank you Lana for what you did for Ed.